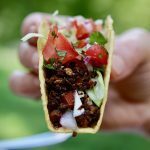 This Tex Mex Vegan Taco meat Recipe is so delicious, and it’s oil free, nut free and gluten free! The Whole Family will love it!! Add tofu to the bowl,crumble it with your fingers as you go, mix it all up. Now add your mushrooms to food processor in 2 batches, process until they are quite small but not mushy, add them to the mixing bowl. Bake at 350° 40-45 minutes stirring every 15 minutes. Remove from oven add to bowl and mix in remaining 3 ingredients. You can add more than 1/4 cup salsa to the mix if you like or omit salsa and add some veggie stock instead, either or will be delicious. Adding the salsa or veggie stock gives the taco meat a perfect balance. You should be able to find Tajin seasoning locally, if not you can find it here. I love this Taco meat on a good ole hard taco shell with my Pico de Gallo, couple of pickled jalapeños and some shredded ice burg lettuce. Yum! mmmm Guacamole and hot sauce would be great too!